"Select Layout Required" to See Photo Sizes. 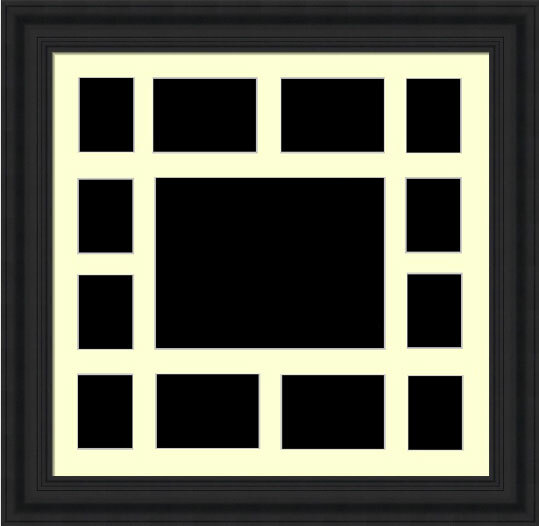 Select the "frame it" button and you can select from over 250 Frames. If you want a different colour for the mount, just say so in comments section at checkout. If you cannot find the layout your require, Call us on 09064 77346 or email design@pictureframes.ie and we will make the layout you want. You can have up to 30 photos in one frame. If you want to design your own layout and email it to us, Click Here. SELECT LAYOUT REQUIRED 4 photos - size 4"x6" 4 photos - size 5"x7" 4 photos - size 6"x8" 4 photos - size 8"x10"
SELECT LAYOUT REQUIRED 5 size 4.75" x 3.75", 1 size 10" x 8"